Faith and has had the sort of childhood that she would never wish on anyone. Her mother is a druggie, her father a mystery, and Faith has no one, and no hope of escaping anytime soon. When Faith’s mother gives birth to her half-sister, Faith knows she has to act. She takes the baby, names her Addy, and runs away, passing Addy off as her own daughter. Faith is used to hard living, but she never imagined just how difficult it would be to care for an infant on her own...nor did she imagine the generosity, kindness, and love of Chris, who takes them in. But even though she has found the sort of family she has always longed for, Faith isn't sure if she can continue to live a lie. Jamie Blair's novel is a quick, emotionally intense read. Faith's home life is horrifying, and Blair's depiction of her mother quickly creates sympathy for Faith and her plan to save her little sister from the sort of life Faith has had to endure. Blair doesn't sugarcoat the difficulties and challenges of caring for an infant, especially alone, on the run, and without a lot of money. Faith's determination to save her sister and her stoic acknowledgment of the difficulties ahead of her will endear her to the reader, but despite her strength she's grateful when she stumbles upon Chris and his family, who take her in, give her a job, and love her and Addy. Of course, the situation is not simple at all, and Chris's family is still trying to heal after their own tragedy. As the tension between the characters escalates and Faith gets more and more anxious about being charged with kidnapping, Faith realizes that no matter how hard she worked to provide for Addy and find the sort of family she always wished she had, she must be honest about who she is. The ending is rather abrupt, but it leaves the reader with many questions about love, family, and morality to ponder. 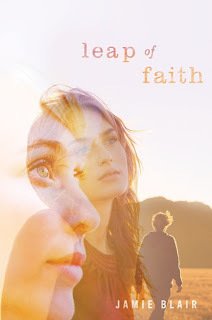 Leap of Faith is an quick, powerful book about the strength of love, healing, and forgiveness. Cover Comments: I like the colors of the cover, and the images of the girl(s), however the way they are arranged remind me of that rather unfortunate trend on '80's school pictures where the school photographer would take all of these mug shots of you and your mullet and then superimpose them over each other. You know what I'm talking about, right? Bad memories. Leap of Faith will be available on September 3rd, 2013. The first thing I thought was "but that's kidnapping!" so I'm glad you addressed that in the summary. :) I love a good tearjerker like this, and I'm a total sucker for books where siblings play a huge role in character development. Sounds like my to-read list just got bigger (again). The premise sounds really intriguing and I’m glad you liked this even though the ending was cut off. The whole idea of having an alias and starting a new life somewhere else is really exciting – and even more so when you have a criminal past. And add a boy to the equation? I’m getting excited goose pimples already! Thanks for the review, it sounds good and I've this on my most wanted list. I love the cover! The story sounds pretty good... although I'm not too sure how I'll feel about the abrupt ending. Is there a sequel?